Construction 8! There's a lot of flashy stuff we can do with this. Oh, is there ever. Well at least we got one of them. Seriously, how do you survive a mind hunt attack? And proclamations of doom. But the only effect of the proclamations of doom is to increase the unrest, and there's almost nobody left in that province anyway - that's the Well of Pestilence - so who cares? Glade Woods is the site of all my Mind Hunts. This actually explains a bit: we're facing a werewolf mage. I guess Midgard's mages also have a werewolf form, and Mind Hunt only kills the first form. 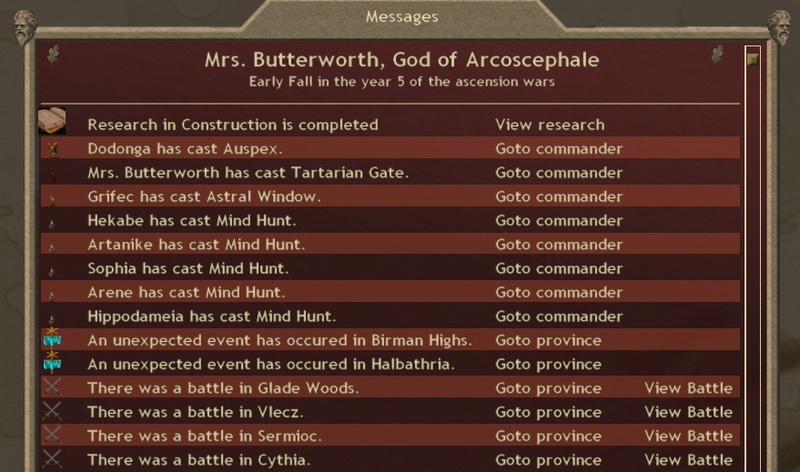 It turns out that Midgard's army didn't move at all, which was the purpose of all those Mind Hunts. Ten wasted gems. 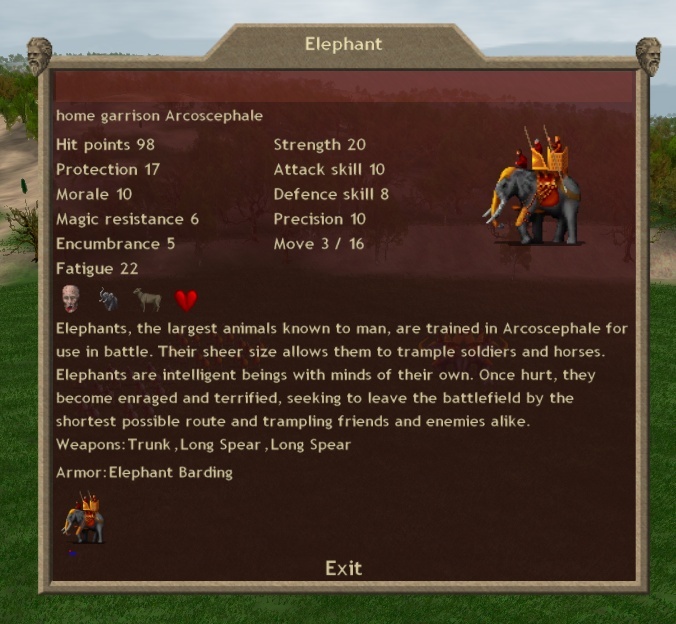 The werewolf mages manages to Disease one of my elephants with a lucky lightning bolt, but here's where Gift of Health gets ridiculous - even after taking damage, he has almost a hundred hit points. 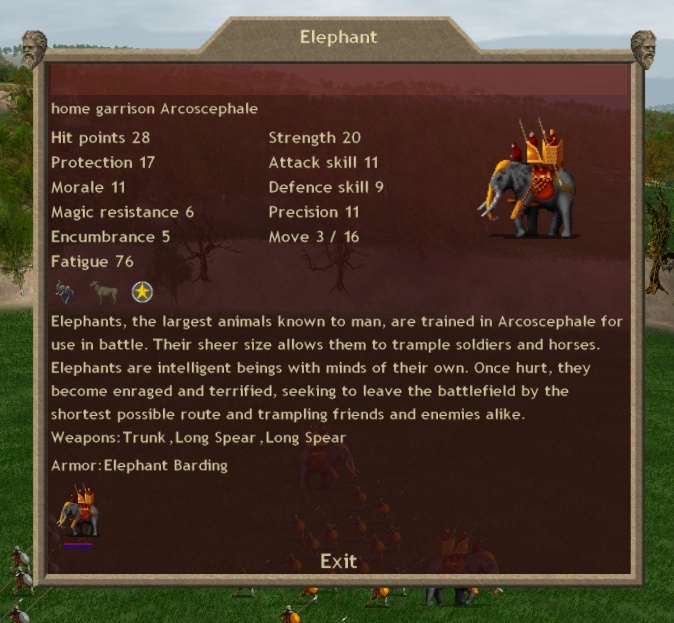 That's a hell of a durable elephant. 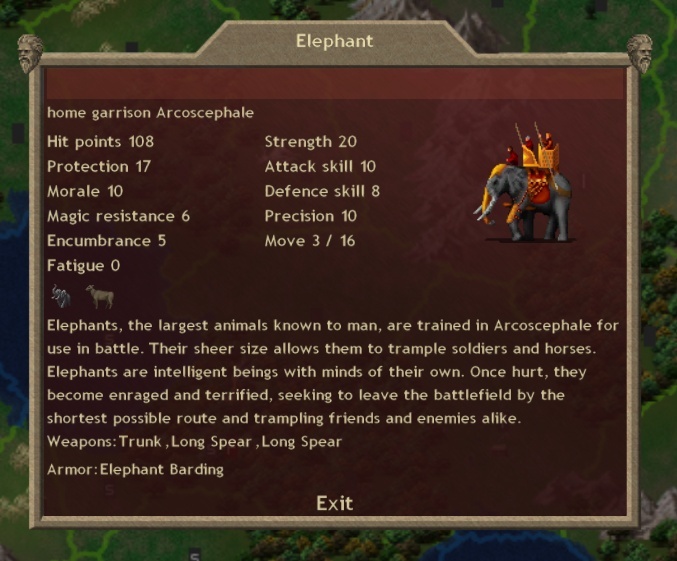 Our elephants act as lightning rods. 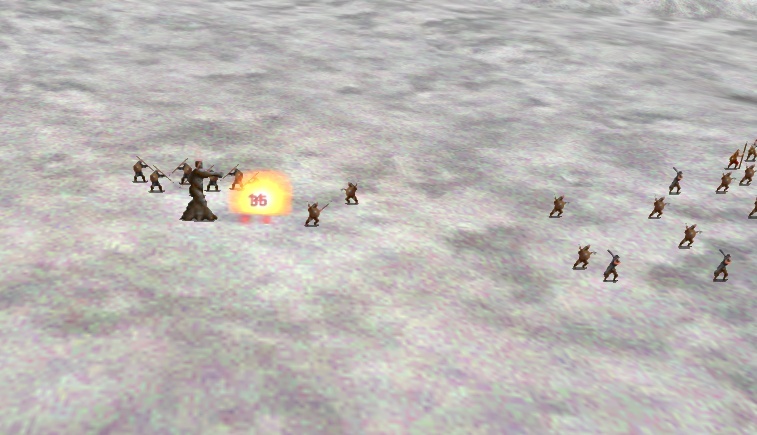 The Midgard mages love attacking them. Without Gift of Health, they would both have died. As it is, they're both alive, and that Disease may be cured soon enough to save him. 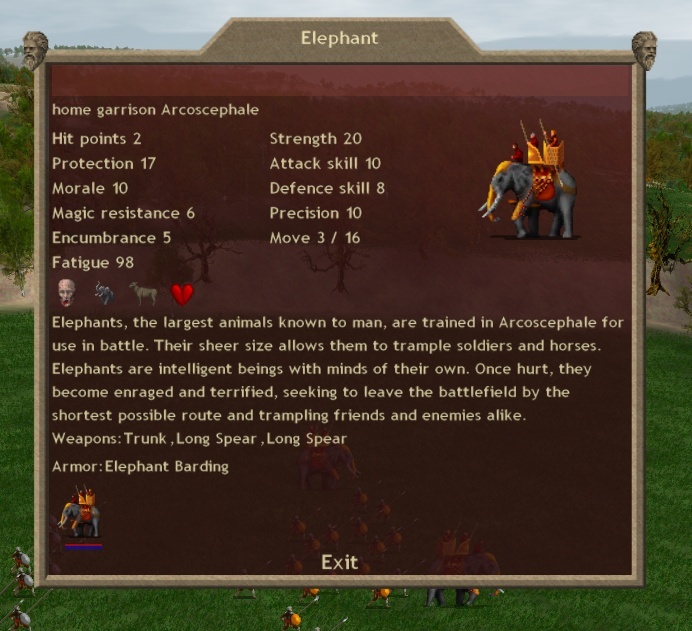 In fact, checking my elephants after the battle: looks like he was cured just fine! Vlecz. On one side is a King of Elemental Earth. On the other side is a small Midgard army. In one hit, the King of Elemental Earth wolfifies two Skinshifters and seriously harms the last. Their counterattacks do negligible damage. 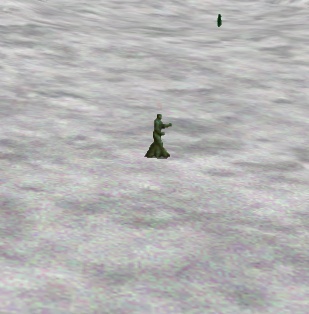 After several of them are slain, they turn and run. The same thing happens to the Hirdmen. Now that's a supercombatant. Victory is ours. 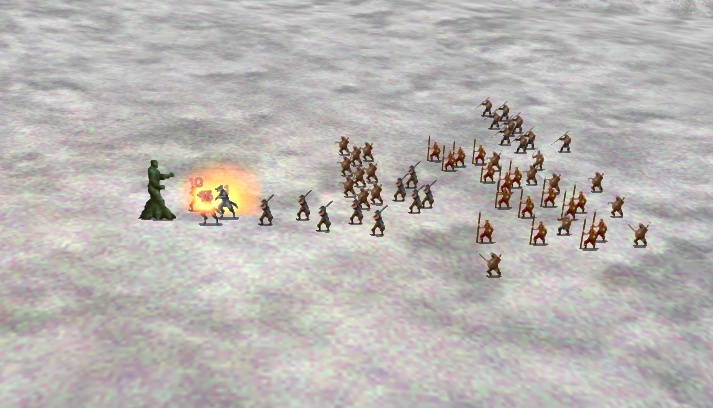 The battle for Sermioc goes as intended. 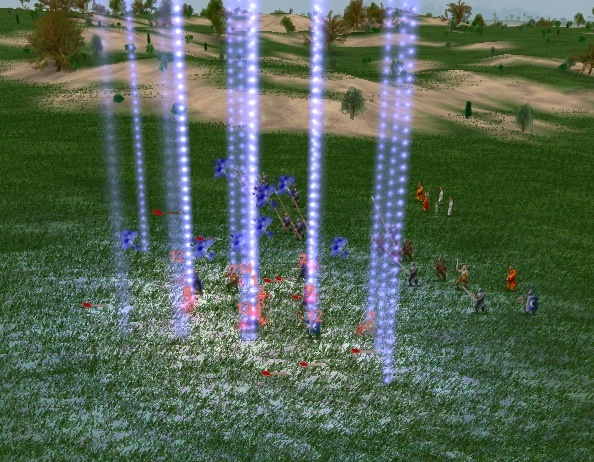 My spell spam obliterates their army and my army obliterates the rest of their army. We lose a commander somehow (I have literally no idea how) but casualties are limited. 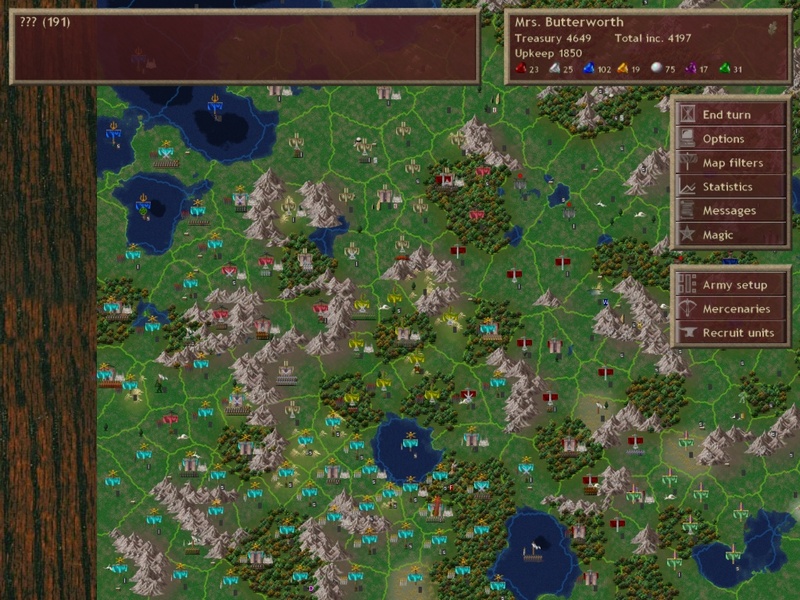 Cythia, Gol Ryepe: more AI skirmishes. Gath moves to break C'tis's siege of their fort (again). The disorganized AI forces can't really hold them off. Our army snags Midgard's fort without any resistance. Yeah, alright, sure. C'tis tries to take territory back from Gath. Despite their disorganization, they win off sheer numbers. We haven't seen much of the Jomon/Ulm warfront in a while, despite me jogging scouts around to try to catch it. Jomon, however, seems to be rallying. This is a large war party, and it decimates Ulm easily. T'ien Ch'i sends an absolutely pathetic force to recapture their capital. They are devoured by my province defense. We capture Typhalia, the little peninsula "northwest" of T'ien Ch'i, with our expected zero losses. We lost all three of the diseased Sages. Sad. Next Winter is coming up pretty soon, but we'll have ten turns to cure that set of diseased Sages. Hopefully that will go better. So, let's start with that Construction level. Construction 8 yields a whole pile of new items, as does every even-numbered Construction level. The different thing about Construction 8 is that its items are unique - only one of each can exist worldwide. 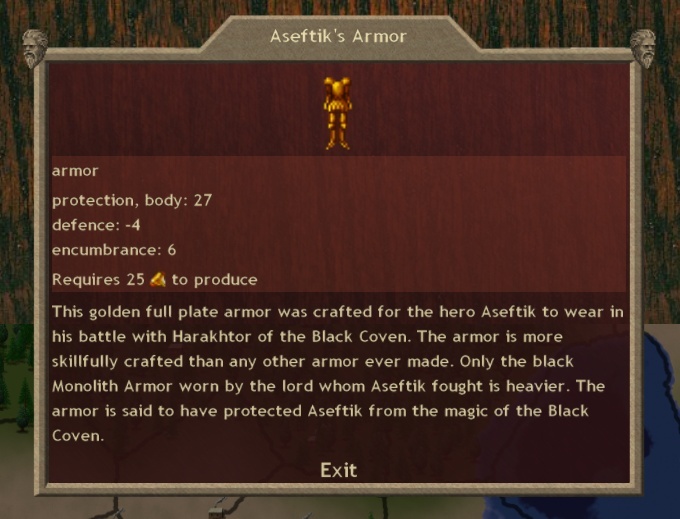 If the item is destroyed it can be reforged, but until then, the only way to get it is to steal it via Wish, which costs 100 Astral gems. Plus, you have to be able to cast Wish. After looking over all the options, I find a bunch of remaining items that are worth mentioning. 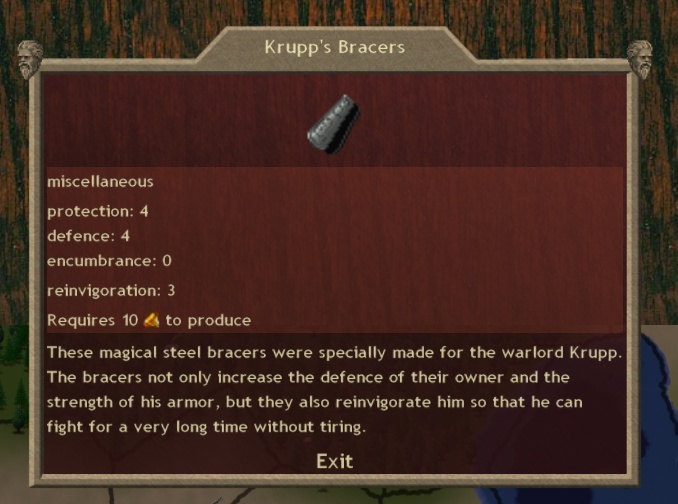 This is difficult because, while you *can* see which items have been forged and which haven't, you can only see that by rigging up a mage with the right gear to forge that item. I'll just list them here. Notable because it's a Water booster that uses the weapon slot. 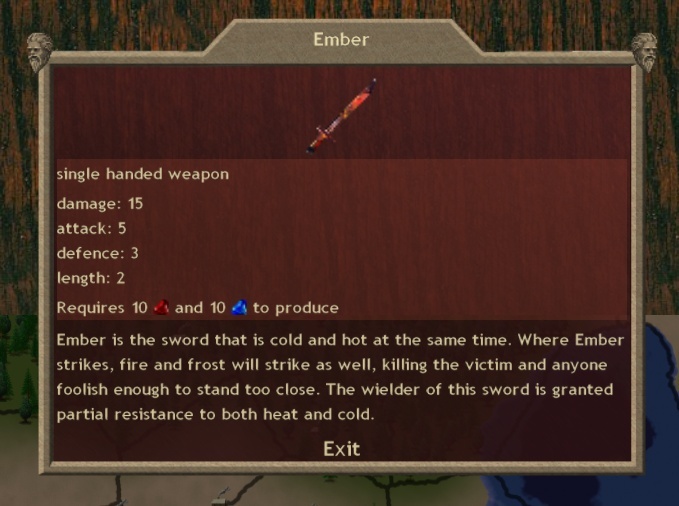 A very nice weapon, like the Fire/Frost brands combined. An Air booster, with Astral attached. Air boosters are tough to get. 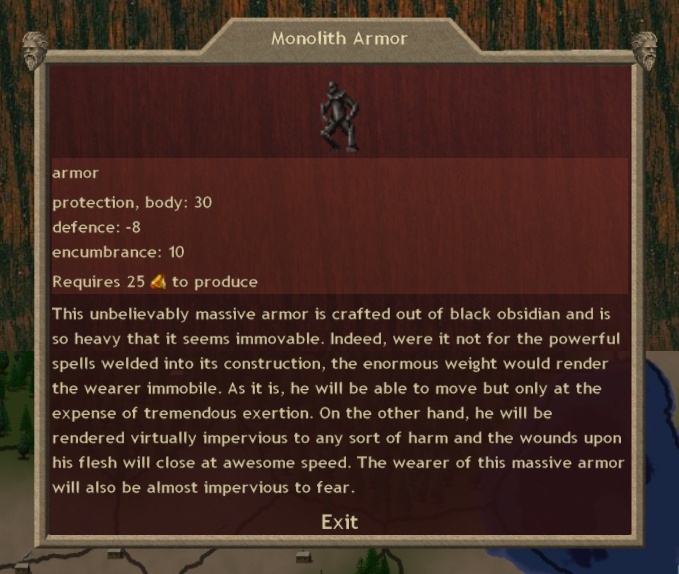 The downside, not mentioned here, is a painful 5% chance of horror mark - I'd want to be careful with this item. 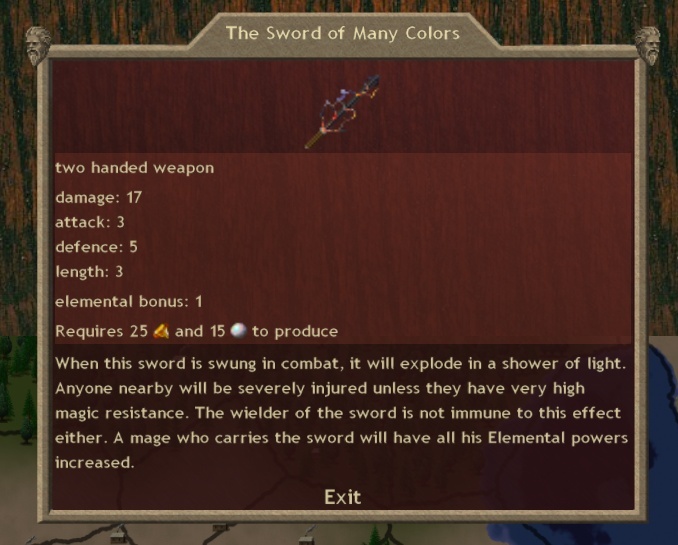 It's a powerful weapon, though annoying due to the AoE effect and the fact that it cannot be used with a shield. 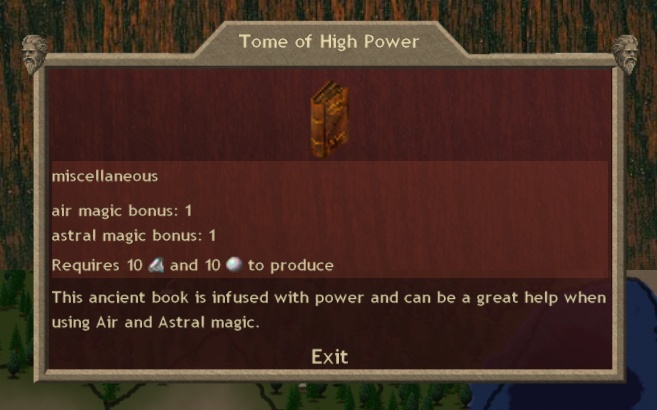 It's also a nice Elemental booster, which, if anything, is what I want it for. Lot of Earth gems though, I may not get to it for quite some time. 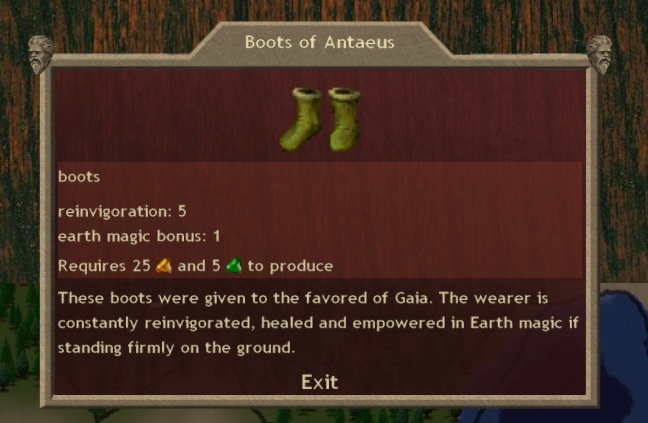 Reinvigoration and Regeneration are two important things for any supercombatant, and these boots wrap them up in one package. Again, though, that's a lot of Earth gems, and I'm constantly low on Earth. Lotta earth gems there, too. I really, really want this item. Proper use of it will give me absolutely unprecedented mobility. 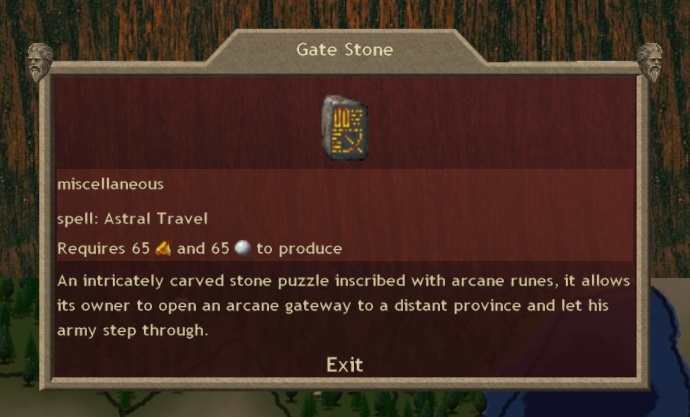 To be honest, though, it'll be cheaper to Wish for it than to actually forge it. We want this item, but more than having it, we want for nobody else to have it. Gath told me via AIM that he's forging it this turn. I could try to forge it also, and one of us would get it while the other would waste a pile of gems. 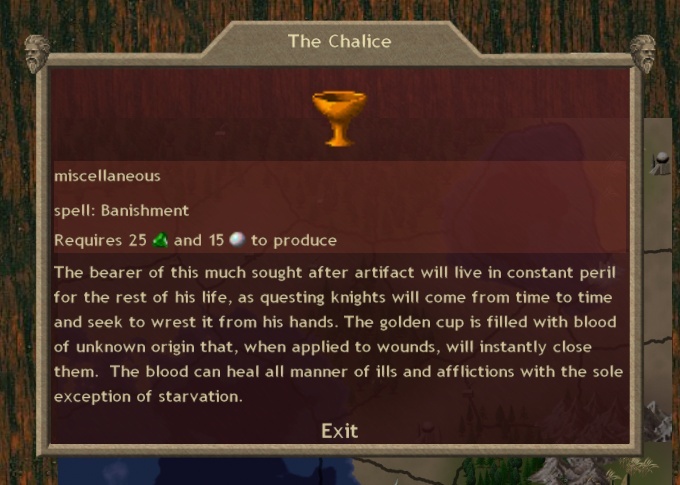 To be honest, I'm not too worried about Gath getting it, so I'm just going to let them have it - right now the gems are more valuable to me than actually owning the Chalice. If I need it, I can just Wish for it someday. Let's look at our new Tartarian. Sweet! A useful chassis, already in Commander form, and with no afflictions. How badass is that? Unfortunately he doesn't quite have the right gear yet - he'll have to bum around for an extra turn while I forge another Luck Pendant. Additionally, he's using a lot of gear that I'd intended to give to my water-based warrior. So . . . we get to forge another set of gear, I suppose. 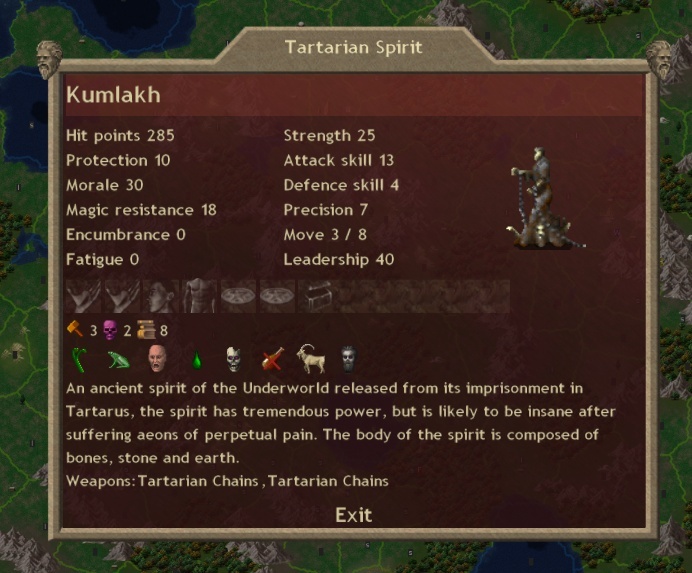 The Worst Tartarian Ever is down to four afflictions, and nearing the point where he's worth using - once he's regrown an arm and lost Feebleminded, I'll probably figure out his gear and get him going into battle. The other Cyclops is down to a Never-Healing Wound which is actually pretty trivial, and the Monstra is merely feebleminded. The Cyclops is a better choice for Gift of Reason (partially because I've got all these boots I want to use), but the Monstra isn't far behind. God, I'm spending so many gems right now. Good thing I have the income for it. Mrs. Butterworth forges the Tome of Gaia, as she's the only caster I have with both Nature and Earth. One of my Crystal Sorceresses, augmented by the Ring of Wizardry, forges the Tome of High Power. 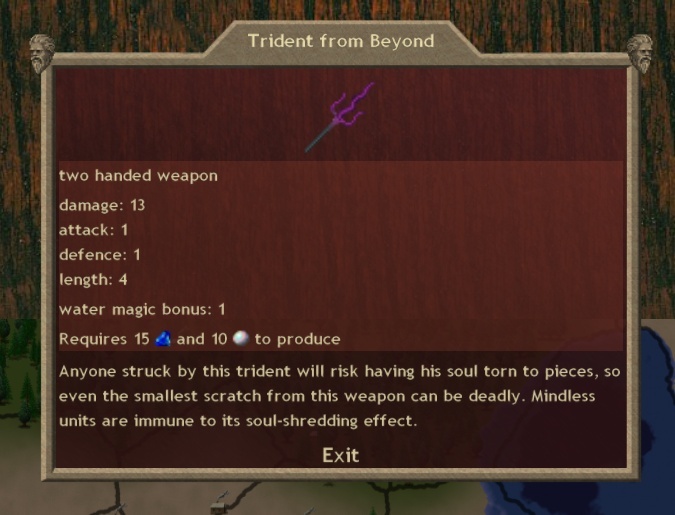 We grab a Mystic hanging out in T'ien Ch'i to forge Ember, and a Sibyl in Arco to forge the Trident from Beyond. 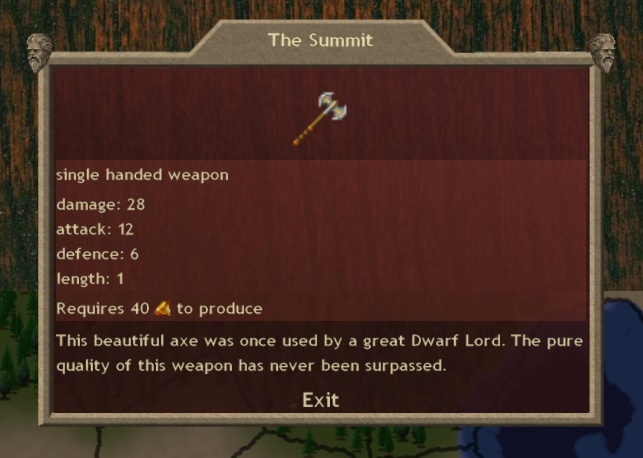 And finally, we have our hero forge us another Hammer. That's just the big stuff, note. 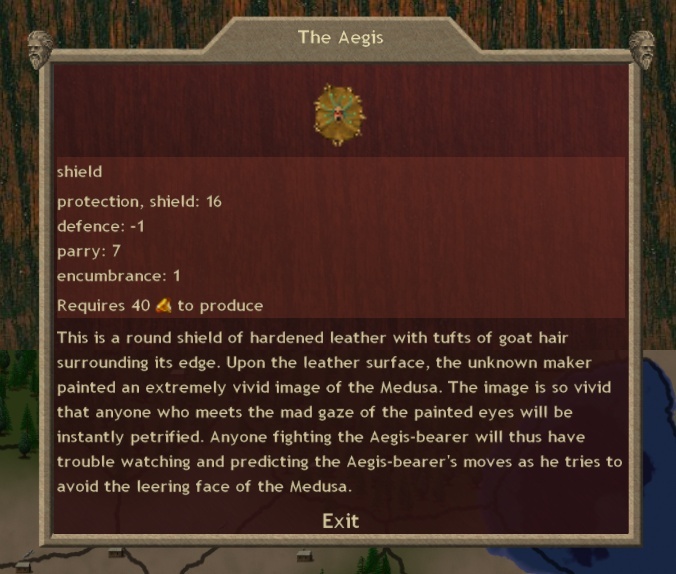 We also forge a few cheap miscellaneous-slot items and a new shield. We're burning through gems like you wouldn't believe, but this stuff is all going to be used. We don't end up summoning another Tartarian. We already have a gem shortage issue, and Mrs. Butterworth is busy forging. Orders given clockwise, from Yldmyre. That's north of Linshire and east of C'tis - the little probe I have going into Midgard territory. Actually, we're starting slightly north of that. 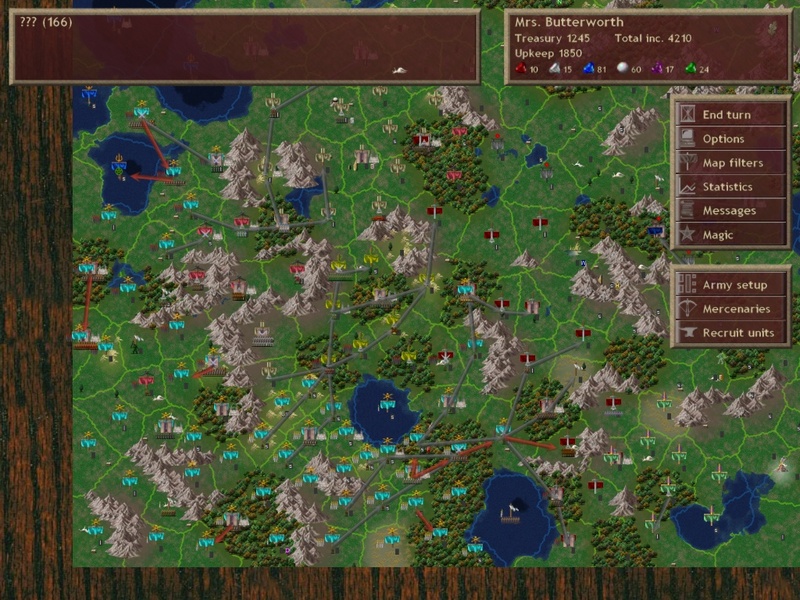 There's a province with no military units and no local defense. We'll attack it. We'll probably lose as the AI shuttles some crud around, but it's worth the try. South of that, we're sieging Yldmyre. I actually won't be surprised if Midgard breaks out successfully, as I have a relatively puny military here. I jack the tax way up and pray. 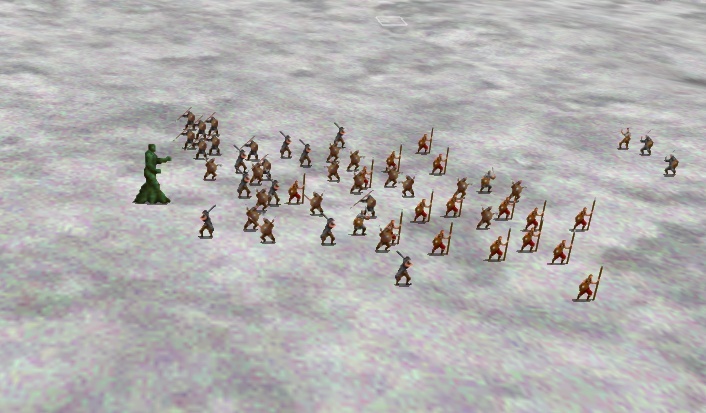 Barathrus troops east to hit a Midgard province castle. I want to claim as much land as I can, and Mictlan is getting close. An infantry squad behind him will hit a castle next turn, then get backup from mystics from Linshire to reinforce. A pair of Sibyls leave Arco to pick up some Sprites that evacuated in the battle at Linshire. Besides all the crafters, the remaining forces continue research - we're up to 813 RP, more than any other nation, and about to pass Ulm in total research. Down in Agartha, we dispatch our new attack squad to go kill those Barbarians. They'll get there in two turns. 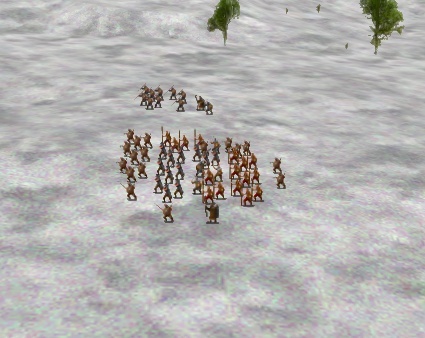 Our Sermioc army moves west, heading for Kishia. It'll be good to consolidate our territory at last. I'm tired of spreading out among Azimar and Boddern Weald. I focus my strength at Azimar - I'll actually bounce my forces back and forth a little, but I'll focus more on Azimar than before. 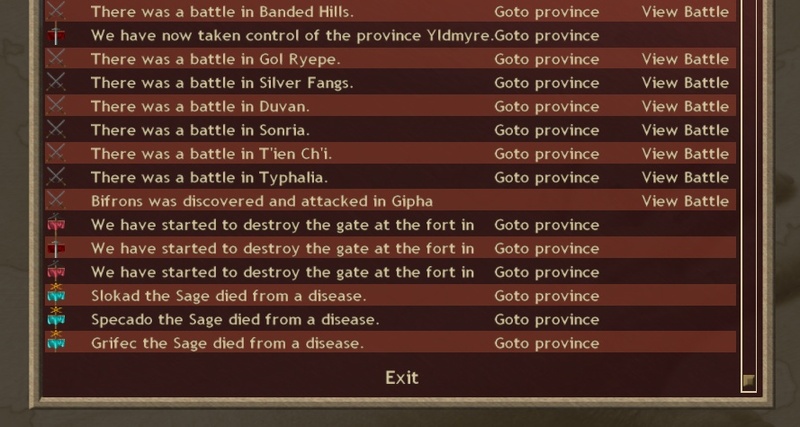 I want to capture these forts, again, largely just to consolidate territory. Near T'ien Ch'i, my aquatic attack squad heads underwater, for the first attack on Atlantis. The peninsula squad goes south to clean up some of the T'ien Ch'i troops that we left behind. The cleanup against T'ien Ch'i is nowhere near done, although the war itself is rather conclusively won. The Faery Queens consolidate in T'ien Ch'i. They'll spend all possible downtime casting Auspex so I can get serious air gem income going. I'm no longer recruiting Hoplites - my chaff recruitment is back to Hypaspists. I have the money for them, and while they're not quite as durable, the map movement is important. I end recruitment with 2500 gold left over. Three temples costs 1200 of that. We'll be making more temples in the future. I have an absolute storm of scouts moving out and don't feel any particular need to recruit more. Seriously, look at that spiderweb of scout movement. Next: The war machine trundles on.